47 LF-40 Combination Wrap / Panel Labeler. 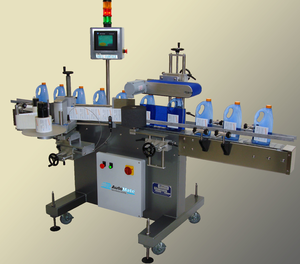 Model LF-40 is a Pressure Sensitive Panel Labeler for Round, Flat Sided and Oval Bottles. Labeling Speeds of up to 40meters/ 1,500inches per minute. The labeling applicator adjusts on 5 axes. European design. User friendly controls and a large color touch screen make changeovers easy and quick.